If you walk in another person’s shoes you can understand their journey. 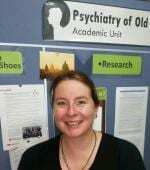 That is the person-centred philosophy behind the “Walking in Another’s Shoes” programme for which Maria Scott-Multani received the 2014 Occupational Therapy New Zealand Whakaora Ngangahau Aotearoa achievement award. The initiative aims to provide education and support for paid carers working with people living with dementia. It is a small group experiential training program that began in the Canterbury District Health Board in 2008. There is now a Walking in Another’s Shoes Educator in every District Health Board in the South Island and other North Island District Health Boards are also adopting the programme. The judges commented that they were “very impressed with the way occupational therapy and occupational practice has been, and continues to be, recognised within this programme. Those people completing the training programme clearly value their training and this provides a vehicle for occupation and occupational therapy to be recognised and to benefit the health and wellbeing of people living with dementia.